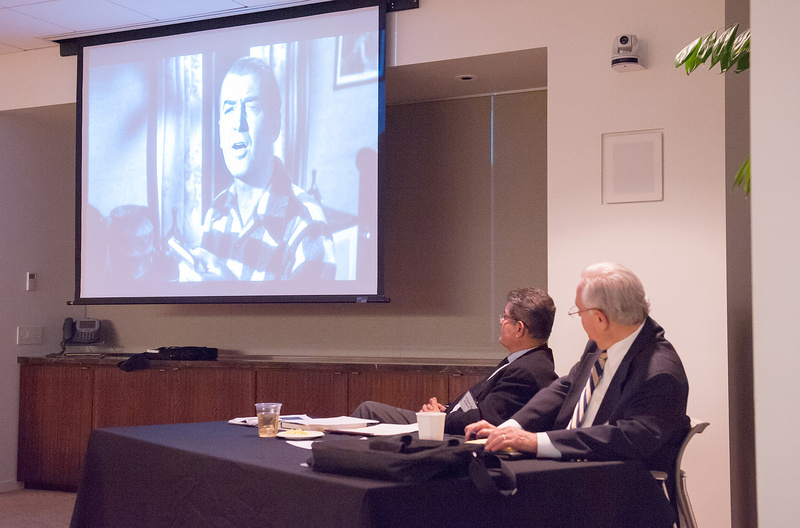 The fourth annual James B. Moran Membership Appreciation Event featured clips from the 1959 movie “Anatomy of a Murder” starring Jimmy Stewart. 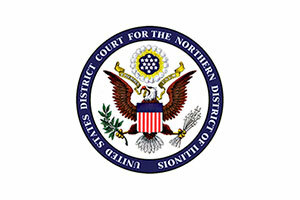 Chief U.S. District Judge Ruben Castillo and U.S. Magistrate Judge Jeffrey N. Cole spoke about the film and its insights into the legal profession. 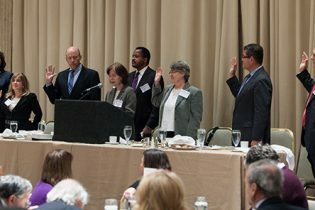 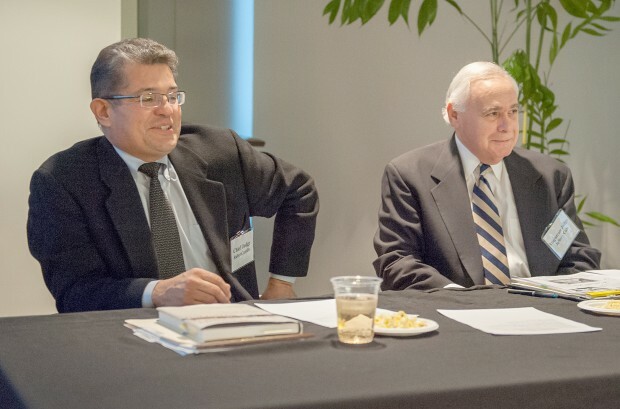 (From left) Tabet, DiVito & Rothstein LLC partner Michael I. Rothstein, Cook County Administrative Law Judge Patrick T. Driscoll Jr., U.S. Magistrate Judge Daniel G. Martin and Chief U.S. District Judge Ruben Castillo exchange greetings at the fourth annual James B. Moran Appreciation Event hosted this month by the Federal Bar Association’s Chicago chapter at Seyfarth, Shaw LLP. 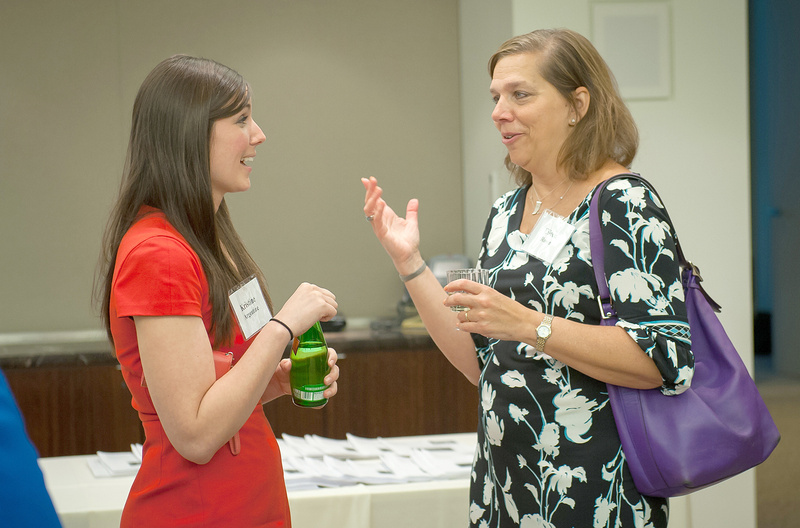 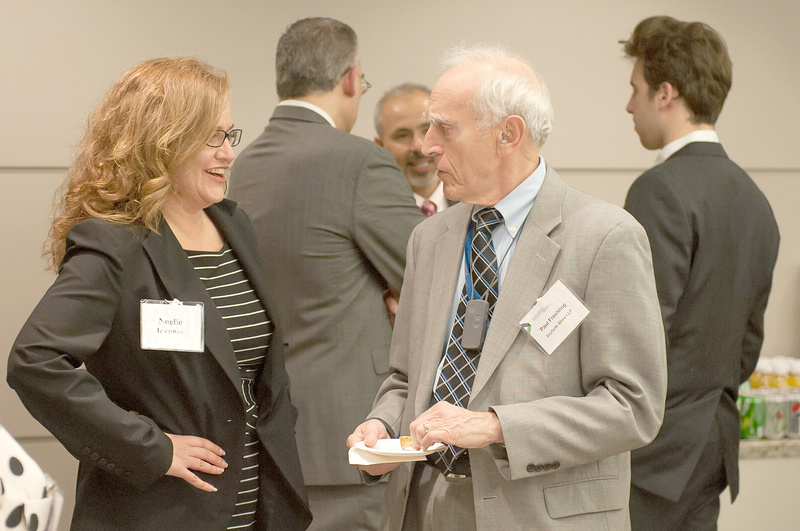 Seyfarth, Shaw LLP associate Kristine R. Argentine (left) and Rock, Fusco & Connelly LLC partner Eileen E. Rosen chat as about 70 members of the Federal Bar Association’s Chicago chapter arrive for the fourth annual James B. Moran Appreciation Event on April 10 at Seyfarth, Shaw. 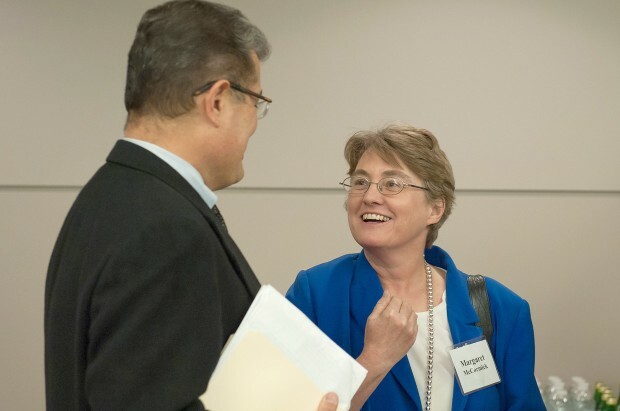 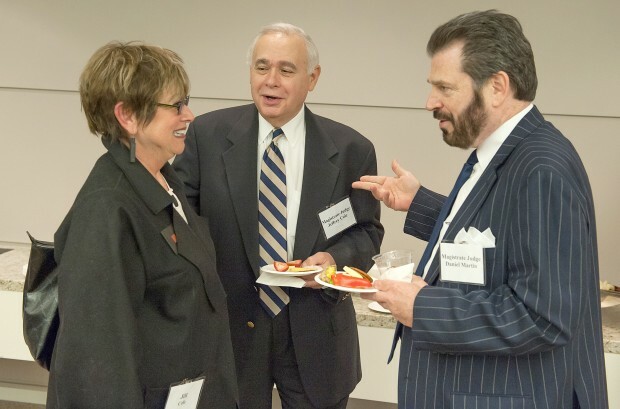 Chief U.S. District Judge Ruben Castillo and Margaret H. McCormick, president of the Federal Bar Association’s Chicago chapter and a principal at Minsky, McCormick & Hallagan P.C., chat at the chapter’s fourth annual James B. Moran Appreciation Event on April 10 at Seyfarth, Shaw LLP. 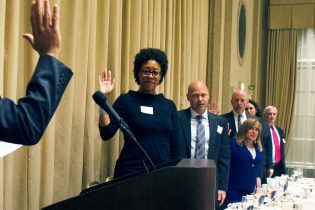 U.S. Magistrate Judge Daniel G. Martin (right) and Jeffrey Cole enjoy hors d’oeuvres as they greet Cole’s wife, Jill, as she arrives for the Federal Bar Association’s Chicago chapter’s fourth annual James B. Moran Appreciation Event on April 10 at Seyfarth, Shaw LLP. Attorney Noelle C. Brennan talks with Paul E. Freehling, senior counsel at Seyfarth, Shaw LLP, at the Federal Bar Association’s Chicago chapter’s fourth annual James B. Moran Appreciation Event on April 10 at Seyfarth, Shaw. 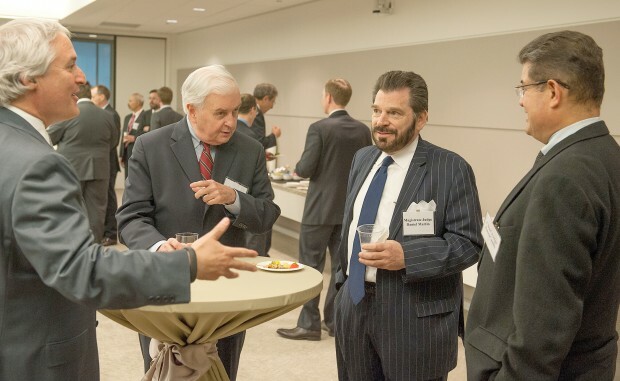 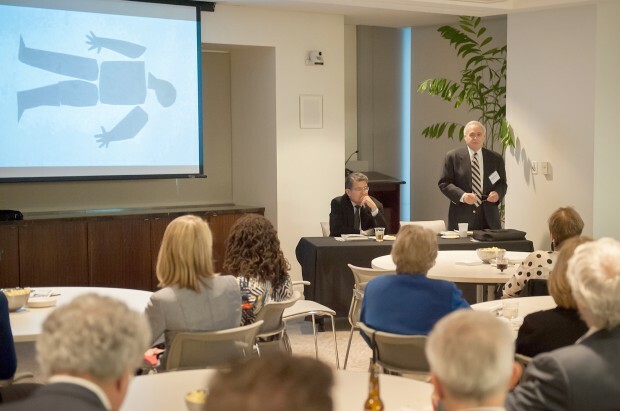 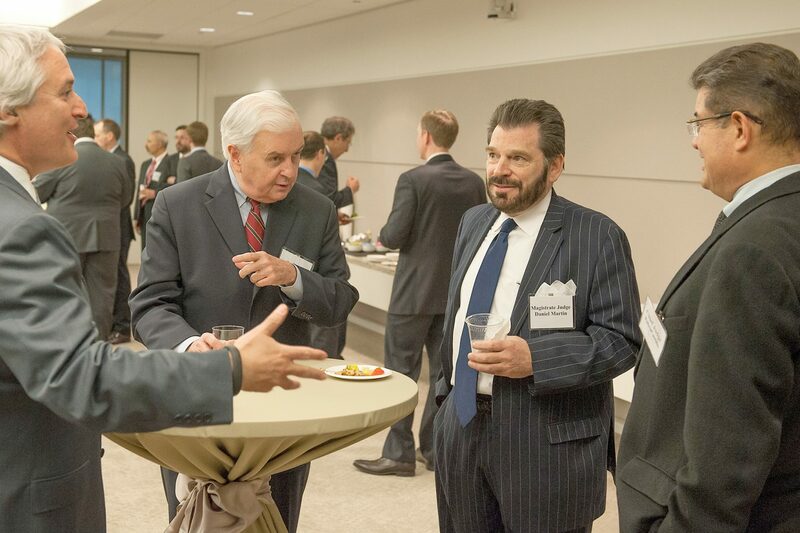 Chief U.S. District Judge Ruben Castillo and U.S. Magistrate Judge Jeffrey Cole participate in a discussion of “Anatomy of a Murder” at the Federal Bar Association’s Chicago chapter’s fourth annual James B. Moran Appreciation Event on April 10 at Seyfarth, Shaw LLP. Chief U.S. District Judge Ruben Castillo and U.S. Magistrate Judge Jeffrey Cole watch a clip from “Anatomy of a Murder” at the Federal Bar Association’s Chicago chapter’s fourth annual James B. Moran Appreciation Event on April 10 at Seyfarth, Shaw LLP.